Chords are Key offers a proven guitar learning method, as simple as 1-2-3! Have you ever wanted to learn the guitar but simply find it difficult to find the time? In just a few hours you can learn enough about playing the guitar to give you years of musical enjoyment – and you won’t have to take private lessons to do it. This crash course will teach you basic chords and get you playing along with your favorite songs right away. Bring your acoustic guitar. Class limited to 15 students. For ages 13+. Our live classes sometimes split the fee into 2 parts: a registration fee collected by the college and a materials fee collected by the instructor in class. The fee for all of our online classes includes our online book and beginning video instruction. What do I need to know before coming to your class? Obviously any experience you have in playing the guitar is going to be a help, but most students who attend the Chords are Key for guitar class have NEVER ever played the guitar at all (and that is why they are coming to the class). We assume when you come in that you are an absolute beginner and take it from there. In the class we will teach you how to form 5 different chords and how to strum your guitar. We also take you through several different songs during the class. Additionally we talk about how to tune your guitar and a lot of very helpful information about how music is put together. We do not cover advanced playing but we do demonstrate some advanced techniques near the end of the class. The Chords are Key for guitar class is designed to be an introduction to learning the guitar. Everything that is covered in the class is also covered on the online videos that go along with your Chords are Key for guitar online book. We expect that when you go home you will practice your guitar using this book and the videos. You will be able to take this at your own pace and rework each practice step as many times as you need to. Most students will complete the material from the Chords are Key for guitar class in 2-8 weeks time. What can I realistically expect to do after taking your course? After attending the Chords are Key for guitar class you should be able to strum along with simple songs right away using the chords you have learned in the class. Many songs just have 2 or 3 chords in them and it is really surprising what you can do if you know just a few chords. It will take some time to develop calluses on your fingers and there will be some pain involved at first but you will be on your way sooner than you think. Are we practicing the whole time? The Chords are Key for guitar class is partly hands-on instruction and partly lecture/demonstration. This is by design. We play for a while and then you will take a break from playing while your instructor does some lecture/demonstration (and you will also get to rest your fingers during this time). Then there will be some more hands on instruction and so on. Will I have to play in front of other students? Most of the students in the class will be absolute beginners just like you so you don’t need to be self conscious about your skill level. Students are encouraged to simply strum along as they are ready and everyone learns at their own pace. Does this class apply to electric guitar as well as acoustic? How can you effectively teach a group in 2.5 hours? The class is designed to be an effective introduction to learning the guitar. In order to actually play the guitar students need to use our online book and videos at home and practice at their own pace. Many guitar players are entirely self taught and it is not at all unreasonable to expect that a student could take our materials home and learn the guitar in this manner. Many students simply learn a few chords and are happy with this level of playing. Others take advantage of the advanced materials we offer and are able to go on to a much more advanced level of playing. Others will want to go further and we plan on offering online guitar lessons soon to help students perfect their skills and go on to a much more advanced level of playing. How can I get really good at playing the guitar? We can get you started on the guitar in the Chords are Key for guitar class but to become really good at the guitar will take years of dedication and practice. You could take private lessons or you could take advantage of our online guitar lessons when they become available. Many locations sell guitars and one store is not any better than another. What IS important is to get some good advice from someone who really knows about guitars and what to look for. If you have a friend who plays guitar it would be good to ask for advice from this person. Obviously a store that specializes in guitars will be able to show you a better selection and offer you more options than a store that does not specialize in musical instruments. Where do I get guitar music? Music stores of course carry guitar music but there is also a LOT of guitar music available today online for free. Simply type in the song title that you want to play on your search engine and you will probably be able to print your song out online for free. This will most likely give you the lyrics for your song and the chords you need to strum. Every musician will tell you that part of learning an instrument is natural ability and part is simply hard work. Every student will not learn to play at the same level of skill but we start out with the idea that everyone can learn the guitar. The minimum age for attending the class is 13. There is no maximum age. Adults of all ages attend the class. How do I know if my guitar is functional enough to use in class? Your guitar needs to have 6 strings and not have any obvious defects. It must be in good enough shape that your instructor will be able to tune it and it will stay in tune after this is done. Please do not bring a bass guitar or a ukulele to the class. These are both entirely different instruments than a regular guitar. Do I have to have my guitar tuned before coming to class? If you can tune your guitar before coming to class this will be a big time saver but don’t feel that this is absolutely necessary. One of the first topics we cover is how to tune your guitar and your instructor can tune your guitar for you at the class. If you need to have your guitar tuned it would be helpful for you to arrive early to the class so that this can be done before all the students arrive. If I am good at guitar hero will this help me play? Guitar Hero is a really fun game but it has nothing to do with really playing the guitar. You will find this out very quickly when you come to the class. But that doesn’t mean that playing the guitar is not fun as well. There’s a reason why the guitar is such a popular instrument. It is really fun to play. How long does it take before it doesn't hurt anymore? Developing calluses on your fingertips is one necessary step in becoming a good guitar player. If you practice consistently on the guitar for 30 days you will have developed some good calluses and the pain in your fingertips will become more of an occasional thing rather than something that happens to you every time you pick up your guitar. Will you teach us how to strum? We go over some simple guitar strumming patterns in the class. This is also covered in the online videos. How many chords do you need to know to play a song? Many people are not aware that American music is built around 3 chords – rock and roll, country music, blues, folk music-all of these styles are built around 3 chords. There are professional guitar players who do nothing but play 3 chord songs. They are not playing sophisticated music but they are actually getting paid for it. We think you will want to get beyond the point of playing simple 3 chord songs, but it is encouraging for beginners to understand that they can do a lot with a few chords. The most important thing about practicing is consistency. Many people assume that if they cannot devote an hour a day to practicing their instrument that they should not even bother trying. This is not true. Even a short practice session on a daily basis will eventually result in significant progress. We encourage our students to start out with 2 short practice sessions in a day, one in the morning and one at night. Even 15-20 minutes of practice a day will add up over time to a lot of practice time. What is the difference between an acoustic and classical guitar? A classical guitar has nylon strings and also a wider neck than a normal acoustic guitar. Many students bring classical guitars to the Chords are Key for guitar class. People are absolutely astounded at the musicians they know who can play guitar totally “by ear”, in other words, they don’t need to refer to anything written down. It seems like they can simply sit down and play anything by magic. It’s not magic. If you can hear and remember music and you know just a little bit about how music is put together you can learn to do this too and we can teach it to you in this one session. We can also teach you how to transpose music and even how to get music off of recordings. Prior experience with chords is recommended. There is a registration fee collected by the sponsor (college or recreation program) ahead of time. This fee varies from location to location. For the exact fee contact the class sponsor listed on the “enroll in a class” page on this website. Often this class is offered on a Saturday afternoon back to back with the Chords are Key for Guitar class. A discount is usually offered to students who attend both classes on the same day. This discount is usually around $10. What do you mean by "playing by ear"? When we talk about “playing by ear” we are talking about creating music without the use of any written material of any kind. You simply have a song memorized in your head and you want to play it. What is the difference between the Chords are Key for Guitar class and this second class on "playing by ear"? The first class – Chords are Key for Guitar will give you the basics of how to strum simple chords on your guitar. 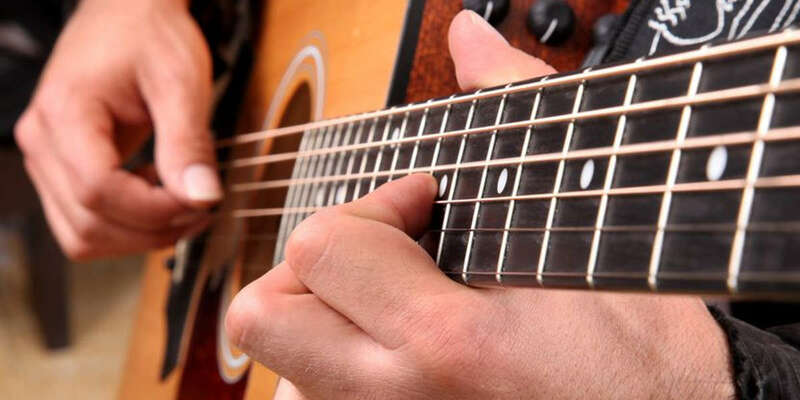 This second class – Chords are Key for Guitar by Ear – builds on the information in the first class and will teach you how to pick out simple melodies by ear without the help of written music of any kind. It will also teach you how to put the chords together with these melodies and make your music into a song (again, without the use of any kind of written music). When you understand some basic facts about how music is put together this is easy to do. Everything covered in the class is also covered in your online book. There is also online audio instruction to go along with your book. There are 15 songs to learn by ear online. I have often asked people who play by ear how they do this and they can't even begin to explain it. Don't you have to have a really special talent to do this? This is a very common misconception about playing “by ear”. The reason people think that people who do this are “musical geniuses” is a combination of things. First, this concept is almost never taught by instructors, and in addition when people are asked about how they do this, they almost always give a very unhelpful answer like, “I don’t know, I just do it”. The truth is, no one is born “playing by ear”. It is a LEARNED skill and actually very easily learned. I am an absolute beginner. Is it really possible for me to take this class and learn this skill? How can I remember what you teach when I go home? Everything covered in the class is also covered in the book and also on the practice CD you take home with you. There are 15 songs to learn “by ear” on the CD. You follow along with the book and imitate the recording.